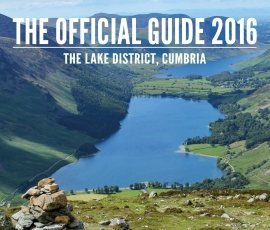 The 2016 Official Guide to the Lake District, Cumbria is out now! Cumbria Tourism the official tourist board for the county, is pleased to announce that the 2016 Official Guide to the Lake District, Cumbria is now available and ready to inspire holiday makers to book their visit and plan fantastic days out in our stunning county. The Lake District, Cumbria. The competition took place in 2015 and attracted more than 400 entries capturing the true beauty of the area through the eyes of fans from all over the world. However it was Mike Whitehead’s stunning image of Buttermere from the summit of Fleetwith Pike that made the short list before coming out on top in the public vote. The 2016 guide features key information on what to do and where to stay. From luxury lakeside retreats, cosy country inns, beautiful B&Bs and quirky pod retreats not forgetting the many museums, independent shops and mouth-watering cafes and restaurants we have on offer. Produced by Cumbria Tourism, over 150,000 copies of the guide have been printed and over 160,000 e-mail alerts have also been sent to our visitor database letting them know the all new guide is out. The 2016 guide is also supported by a range of other marketing materials including; 420,000 copies of the 2016 Attractions Guide, distributed throughout the county in high footfall areas and at a number of key locations outside the county. Along with the increasingly popular Food and Drink Guide that showcases a whole host of tasty places to eat and drink across Cumbria, including tempting tearooms, fantastic farm shops and award winning restaurants. 2. With over 40 years of continuous service, Cumbria Tourism is the lead organisation for tourism in the county and is at the heart of the Cumbria visitor economy. It has a membership of more than 2,600 members who in turn employ thousands of employees. 3. In 2014, over 41 million people visited Cumbria contributing more than £2.44 billion to the local economy and support around 58,000 jobs.